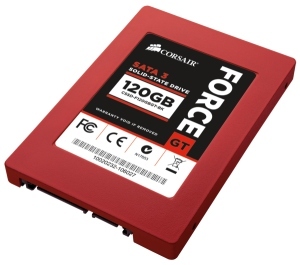 Corsair has announced the first shipments of its Force Series GT line of solid-state drives (SSDs). The first SSDs are currently shipping to Corsair's network of authorized distributors and retailers worldwide. They are expected to be available starting this month in 60GB ($150) and 120GB ($280) flavors. As always, Corsair warns that stated capacities are unformatted and actual capacities will vary depending on the formatting and operating system used. All Force Series GT models are backward compatible with SATA 2, and include a 3.5-inch adapter for use in both notebook and desktop PCs. Corsair claims the new Force Series GT line is designed for enthusiasts who demand the fastest performance available. It uses the new SandForce SF-2280 SSD processor, with native support for SATA 6Gb/s (SATA 3), combined with ONFI synchronous flash memory. Force Series GT SSDs deliver outstanding read/write performance and significantly faster system response, boot times, and application load times when compared to SATA 2 solid-state drives. The out-of-box performance is up to 85,000 random write IOPS, read speeds of up to 555MB/s, and write speeds of up to 525MB/s. The use of synchronous flash memory makes the Force GT Series particularly adept at reading and writing non-compressible data, such as video and music files. "With the rapid adoption of systems with SATA 3 support, enthusiasts are demanding SSDs that can push the limit of SATA 3 bandwidth," said Thi La, Vice President of Memory Products at Corsair. "The new Force Series GT line delivers amazing speed under the most demanding conditions, making them ideal for high-performance systems." While 60GB and 120GB flavors are quite nice, it's still not enough for me to switch to SSD completely. Corsair was working on a 240GB version, but the company has not included it in the official announcement. I'm keeping my fingers crossed.